This is an excerpt from this week’s premium update from the The Financial Tap, which is dedicated to helping people learn to grow into successful investors by providing cycle research on multiple markets delivered twice weekly. 30 day refund available if not 100% satisfied. 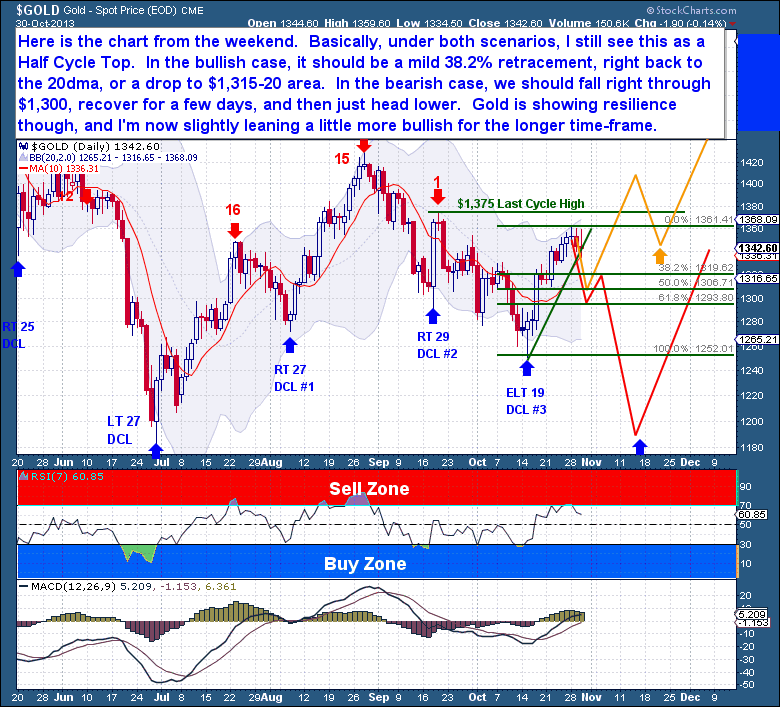 As I pointed out in the weekend report, this has been a fairly impressive gold Daily Cycle. Especially impressive when one was expecting more of a Left Translated Cycle. But with that said, gold has not done enough to extinguish the bearish scenario. Considering that gold is technically still in a longer bear downtrend, it will take more than this current $100 rally to negate that trend. We certainly do welcome the strength; it is after-all out of character for a final Daily Cycle. But this bear market has delivered far more sinister surprises, so I will continue to look at all downside possibilities with much more attention. We should appreciate that gold made a Day 11 high this week, and that’s not exactly bearish. But it’s also a warning sign, regardless of any short term bias. Basically, under both a bullish and bearish scenario, a $110 rally over 11 days is more than enough strength where we should expect a Half Cycle Top. That’s exactly why I marked both scenarios (chart below) as first falling to a HCL, before either scenario could play out. Today’s FOMC was rather a non-event, essentially the priced in expectation of no tapering until 2014 was confirmed. With that news, gold fell, not because it was in any way negative, but simply because it was gold’s path of least resistance. 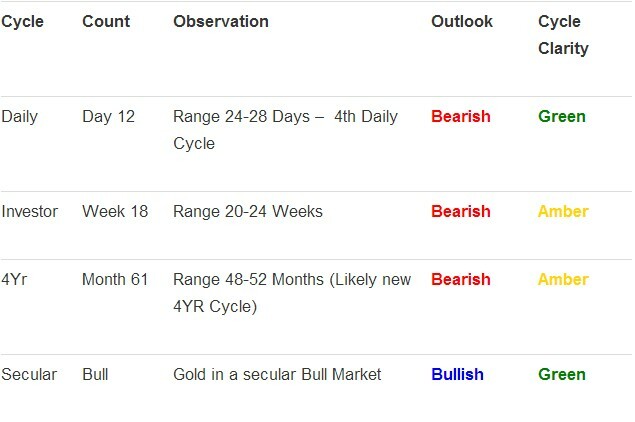 The Cycle was already overbought and slightly extended, so absent of any new material news, gold was simply sold in a normal profit taking event. Now we’re seeing signs that the Half Cycle top is in. The oscillators are turning over and gold printed a Daily Swing High. The dollar has begun a new Daily Cycle, which will add pressure to the decline. If the Cycle topped for now, then the odds favor a mild retracement of at least 38.2% of the Cycle’s gains. That type of decline would be normal, for all the open scenarios. That should equate to a drop back to the 20dma or the $1,315-20 area, the first point where we should consider the next Cycle pivot point.